DALLAS, TX--(Marketwired - Mar 17, 2014) - NPR, National Public Radio, the non-profit media organization that serves as a national syndicator to a network of 900 public radio stations in the United States, recently cancelled its planned segment about Pizza Patrón's upcoming LTO pizza La Ch!#gona. The broadcast was tentatively scheduled to air on Saturday, but was pulled for fear of violating FCC regulations according to NPR's "Code Switch" blog article entitled Pizza Chain That Markets To Mexicans Says New Promotion Isn't Profane. This isn't the first time the media has struggled with how to talk about the company's campaign. Telemundo 39 KXTX, the local affiliate in Dallas/Fort Worth, ran a story called Controversia por el nombre de una pizza on its March 12 evening news, opting to bleep the name in the audio, but boldly showed the point-of-purchase print materials on screen. "Our new La Ch!#gona pizza seems to be causing a lot of challenges for news media outlets," said Andrew Gamm, brand director for Pizza Patrón. "There is a great deal of misunderstanding surrounding the word "Chingón" and how it is commonly used in today's culture, particularly among younger Mexicans. Although the term sounds similar to a common Mexican profanity, it is not intended to offend. On the contrary, it is a compliment of the highest order." As the controversy surrounding the name spreads across media and Internet channels, company officials say that they are weighing their options regarding the new product campaign that is scheduled to launch in two weeks, on Monday, March 31st. "As is always the case with our decision-making, this product's name was not designed to create controversy, it was designed to speak to the hearts of our core Mexican customers using the conversational vernacular commonly heard every day among friends and family. The name La Ch!#gona is a perfect fit for such a spicy and delicious pizza that challenges our customers' tolerance for heat," said Gamm. The product, La Ch!#gona, is a large pizza with approximately 90 slices of proprietary jalapeño stuffed pepperonis topped with fresh, diced jalapeños. Available for a limited time only, the pizza has a recommended price of $7.99. Prices and availability may vary by market. 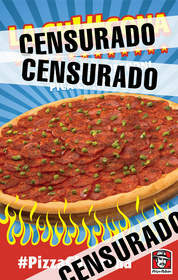 Pizza Patron Campaign - Censured!